Alan Silvestri, Composer, Producer, MainArtist, ComposerLyricist - Terry Edwards, Unknown, Other - London Voices, Choir - Peter Cobbin, Recording Engineer, StudioPersonnel - Thomas Bowes, Leader - Kirsty Whalley, Editor, StudioPersonnel - David Bifano, Producer - Dave Jordan, Producer, Executive Producer, Unknown, Other - JoAnn Kane Music Services, Unknown, Other - DENNIS SANDS, Mixer, StudioPersonnel - STEVE DURKEE, Unknown, Other - Ben Parry, Unknown, Other - Matt Jones, Asst. Recording Engineer, StudioPersonnel - Patricia Sullivan, Unknown, Other - James Findlay, Asst. Recording Engineer, StudioPersonnel - Lucy Whalley, Unknown, Other - Mark Graham, Conductor, Arranger, Orchestrator - Anthony Russo, Producer, Executive Producer - Joe Russo, Producer, Executive Producer - Adam Olmsted, Recorder, AssociatedPerformer - Toby Hulbert, Asst. 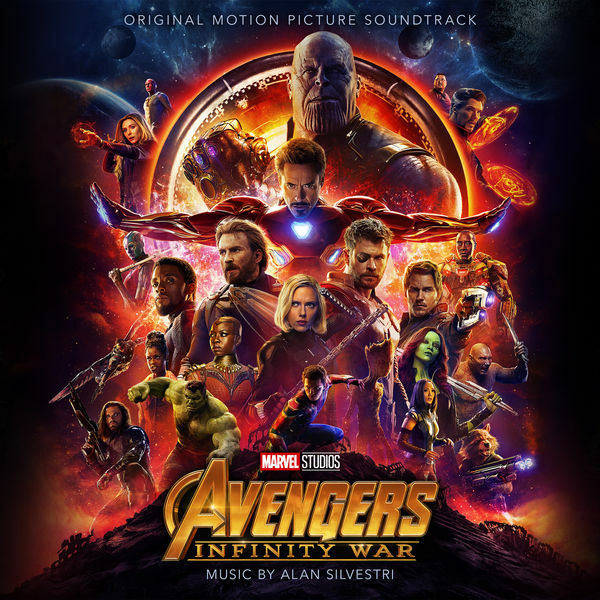 Recording Engineer, StudioPersonnel - Kevin Feige, Producer, Executive Producer - Anele Onyekwere, Editor, StudioPersonnel - Jonathan Bartz, Programming, AssociatedPerformer Copyright : ℗ 2018 Marvel Music Inc.
Alan Silvestri, Composer, Producer, MainArtist - Terry Edwards, Unknown, Other - London Voices, Choir - Peter Cobbin, Recording Engineer, StudioPersonnel - Thomas Bowes, Leader - Kirsty Whalley, Editor, StudioPersonnel - David Bifano, Producer - Dave Jordan, Producer, Executive Producer, Unknown, Other - JoAnn Kane Music Services, Unknown, Other - DENNIS SANDS, Mixer, StudioPersonnel - STEVE DURKEE, Unknown, Other - Ben Parry, Unknown, Other - Matt Jones, Asst. Recording Engineer, StudioPersonnel - Patricia Sullivan, Unknown, Other - James Findlay, Asst. Recording Engineer, StudioPersonnel - Lucy Whalley, Unknown, Other - Mark Graham, Conductor, Arranger, Orchestrator - Anthony Russo, Producer, Executive Producer - Joe Russo, Producer, Executive Producer - Adam Olmsted, Recorder, AssociatedPerformer - Toby Hulbert, Asst. Recording Engineer, StudioPersonnel - Kevin Feige, Producer, Executive Producer - Anele Onyekwere, Editor, StudioPersonnel - Jonathan Bartz, Programming, AssociatedPerformer Copyright : ℗ 2018 Marvel Music Inc.
10 What More Could I Lose? 21 What Did It Cost?